I FINALLY got some decent pics of my Olean CREBs. This is an SN7 (7b.1 for CREBheads). These were used in the Olean, NY area. Over the years I have seen a few in collections and the people who had them said they got theirs from the same place. These are known in SN7, 8, 14 and a 9/16. Since they were all within 1/4-1/3 mile or so from each other, and all have the same characteristic of heavy snow (fire brick flakes), these tell us that Brookfield had at least four different shops working at one time to make CREB beehives. I tried to come up with way to describe the density. Taking a piece of black electric tape 1/4 inch wide and 1/2 long, it was taped to the inside of the skirt. Every internal object that reflected light from a flashlight was counted (as best I could). There are approximately 150 particles that reflect light within that area. 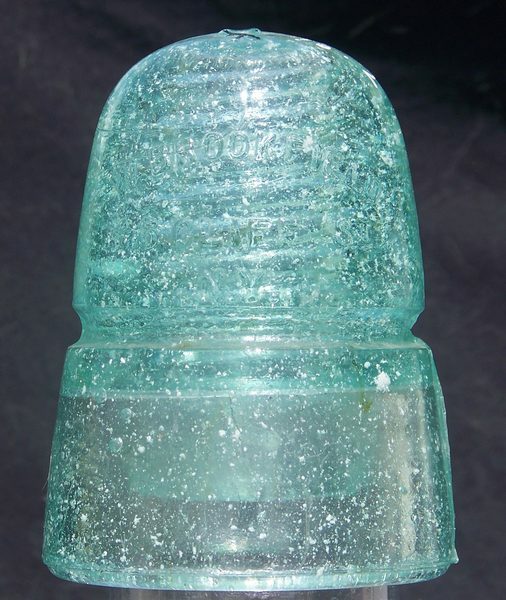 Since the insulator was not shifted during the counting, there obviously are some particles deeper in the glass that were hidden by pieces closer to the top. I also skipped a lot of the tiniest pinpricks reflecting light. View the full sized picture and zoom in to see the density of the snow.